Among the many problems that blind people face is in the workforce. Being blind does not exempt these individuals from having to be financially stable. The blindness places an extra burden on them for being able to earn income. It limits them to their job opportunities. Most individuals looking for employment have to depend on visuals as their resource for job vacancies. Many of these resources have not adapted to be compatible for the visually impaired. This greatly reduces the chances for the blind to be able to determine what job vacancies there are. They are not able to read the want ads in the paper. Also, the job boards on the internet are not developed for the visually impaired. Several of the jobs listed may be ones that blind individuals could fill easily. Examples of this are working in call centres. Or working for charity organisations where communication skills are a top priority. There are many different types of disabilities that people can be afflicted with. A lot of these disabilities will have some impact on them in the workforce. The blind, however, seem to face the biggest challenges when it comes to employment. It would seem that there is more prejudice against the blind in the work environment. It mostly comes from lack of understanding of the capabilities of the blind. Ignorance of this causes employers to be unsettled in hiring blind employees. Another concern is that a blind employee would be too needy. Meaning they would become a burden for those employees who have their sight. Fortunately, there are a lot more organizations dedicated to the blind now than there were in the past. 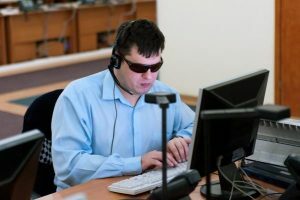 These organisations are taking aggressive and proactive steps to help educate employers on how capable the blind can be.